ReadySetF a s h i o n: Stylist Spotlight: Kate Phelan After Dark VS.
Stylist Spotlight: Kate Phelan After Dark VS. Along with Phelan's wardrobe, set design and hair are stellar. The clothing against it's background come off as delicate and seductive in both stories. If I looked this good lounging, I'd stay in bed all day. 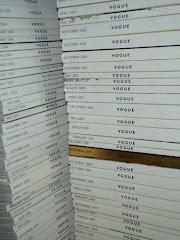 Labels: British Vogue, Kate Phelan, Magazine Archive, VS.
i am so obsessed with that no smoke without fire editorial...there is something very tom ford about it...very appealing! I do love the 2nd one, but I am biased towards the Tom Ford era. The mandarin collar blouse + pencil skirt is very inspiring.